Anyone who spends time in the garden is eventually going to come into contact with poison ivy, poison oak, or poison sumac. I've encountered poison ivy too many times to count, often with disastrous results. One year I had such a case of it that I missed four days of work, most of which I spent as unclothed as possible in front of a fan to control the itching. I'm one of the 70 to 85% of people who have an allergic reaction to the urushiol, the evil oil that causes the rash. Once you get the stuff on you, it quickly bonds to your skin. Viola! Blisters. And untreated, the rash can take a good three to four weeks to run its course. Urushiol-induced contact dermatitis is most likely to happen if you run into the plant itself, or if you touch something that's brushed against the plant–like clothes, gloves, or the cat who insists on hanging out in the PI patch. 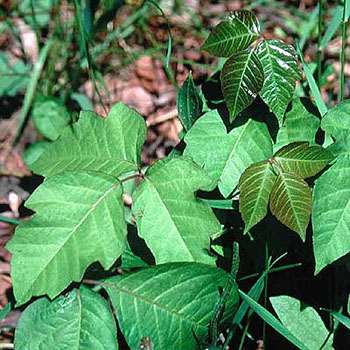 Never, never burn poison ivy; the urushiol can vaporize and get in your lungs. So you've identified the PI. The next step is to get rid of it. If I just see one vine, my usual method is to wait until I'm done with my gardening. I get a plastic bag and put it over my gloved hand. I yank the PI out with the bag, wrap the bag, toss it in the garbage (never on the compost pile), and immediately go inside and scrub my hands. I usually take an antihistamine for good measure. This week, however, I had to tackle a much bigger infestation. PI has inserted itself among the English ivy on the south side of my house, and it was engulfing the windows. I'm a light freak, and I take exception to anything cutting off the amount of sunlight making it into my dining room, especially the damn poison ivy. But this was no small amount of PI. This was the brontosaurus of weeds: ten feet tall and about twenty feet long. This called for the gardening hazmat suit. My hazmat suit consists of a long-sleeved tee shirt tucked into light cotton pajama pants that have at least seven different colors of paint on them (the waist hits me attractively just under the breasts). Black knee socks under the pants minimize the potential of PI at the ankles, and gloves protect my hands. Over this example of sartorial splendor I wear a man's button-up shirt, buttoned tightly around the wrists. (In my experience, it's the wrists and ankles that tend to be your vulnerable areas when taking on PI.) And because I was yanking PI down from overhead, I wore a bucket hat. Oh, yeah, I looked good. It was about 85 degrees the day I took on the PI, so I was sweating like crazy. I yanked it all down, stuffed it into trash bags, and hauled them to the curb. I then headed to the basement, stripped at the washing machine, and tossed every article of clothing into the washer. I took a lukewarm shower, scrubbing three times with soap and a washcloth. I took a Zyrtec, too. I still got poison ivy. Granted, it's not too bad. I have a couple of itchy spots, and it's pretty contained. Don't believe the myth that poison ivy spreads. What actually happens is that the areas that get a higher dose of urushiol break out into a rash first, and areas that weren't as exposed react later. That oozing stuff from the blisters looks gross, but it doesn't actually spread the rash. It does itch something fierce, though. Most people say that cortisone cream (the 2%, not the 1%) is the best way to control the itch, but I've had good luck with the clear Caladryl stuff, too. Unfortunately, I have to give up my beloved baths for the duration of a PI outbreak in favor of showers; prolonged contact with water can aggravate the itching. And I'm pretty religious about taking the antihistamines during an outbreak. Staying cool helps, too. Heat and humidity are even more miserable when you're dealing with PI. So I got the PI off the house, but the PI got in some small jabs. In my ongoing war with PI, I'm calling this one a draw. Next time, though, that weed is going down!